PETALING JAYA: PKR's Indera Mahkota MP Azan Ismail has admitted to being surprised by Datuk Seri Anwar Ibrahim's announcement that he is being dropped from the line-up of candidates in Pahang and moved to Terengganu for the general election. “It was totally unexpected and a surprise because there was no indication of an announcement being made for the Indera Mahkota seat,” he said in an interview yesterday. Azan, who is Terengganu PKR chief, said he had attended the ceramah in Balok Makmur where Anwar made the announcement, adding that he had had the impression that the PKR adviser would only be declaring the candidate for the Paya Besar parliamentary seat. On Saturday, Anwar's announcement that Azan would be replaced by Pahang PKR chief Datuk Fauzi Abdul Rahman was met with boos from the crowd. 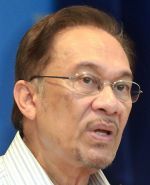 Anwar was said to have tried to placate the crowd by praising Azan and saying that he would be fielded in Terengganu instead. Asked about the booing incident, Azan defended it as a spontaneous response from the younger people in the crowd, who were also caught off-guard by Anwar's announcement. Azan said he was fine with being moved to Terengganu as he was originally from Kuala Terengganu and he had been made its state chief two years ago. However, he stopped short of saying that Anwar's announcement was inappropriate, adding that the question of his candidacy in Terengganu should have been resolved earlier.